The Logicbroker Portal Dashboard is your gateway to connecting with your trading partners, viewing your account information, handling orders, and updating inventory. Orders Waiting to Ship – gives you the count of orders that are in a Ready to Ship or Ready to Acknowledge status. If you click on that box it will bring you to the Waiting to Ship orders page where you can see an overview of the orders and also view a specific order. Noncompliant Orders – gives you the count for orders that are in a Failed status. If you click on that box it will bring you to the Failed orders page. You can see an overview of all Failed orders and also view an individual failed order (where you will then be able to see why it failed). 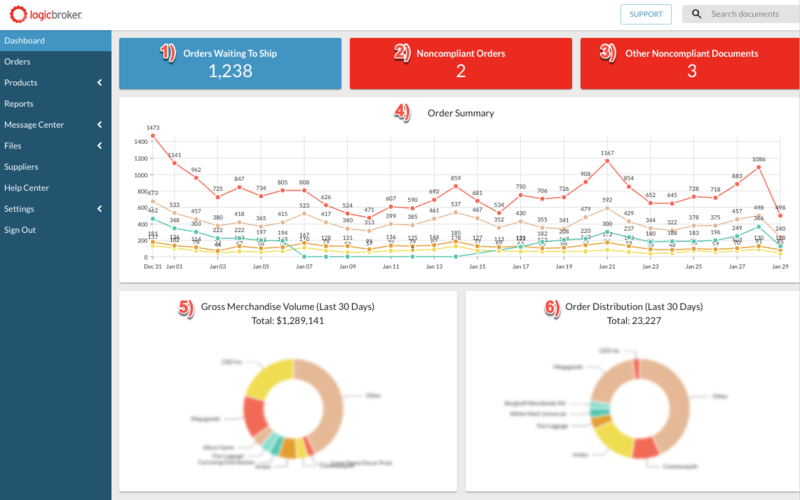 Order Summary – a graph overview of order count broken down by day so that you can see the order number counts and fluctuations. Gross Merchandise Volume (Last 30 Days) – a chart that displays the gross merchandise volume over the last 30 days broken out by trading partner. Order Distribution (Last 30 Days) – a chart that displays the total order distribution over the last 30 days broken out by trading partner.